← Winning the race for a digital nation. Because we’re worth it! As part of our pilot programme with the Department for Business, Innovation and Skills that aims to open up the informal learning to those that wouldn’t normally access it, the fantastic tech team here at Tinder Foundation have been creating something quite special for the Learn My Way website. It’s a Course Creator tool that will allow pretty much anyone to make an online course for their learners – based on their individual needs – while still using all of the infrastructure and data capture from the Learn My Way site – and sharing it too. And last week, our first group of intrepid content creators came together – at the London offices of Mozilla – to start building their own courses. We’ve always known that grassroots organisations know their audiences – and what they want to learn – best, and so it makes sense to give them the tools to create the online learning content that’s right for them. The course creator was unveiled for the first time on Thursday, and by the end of the day we’d already made some great progress with a number of courses well on their way to being finished, with lots more in progress. And the diversity of courses created, started or talked about shows just how useful the course creator can be. Courses included healthy eating on a budget, digital grandparenting and coping with cancer, and that was only in a small group. 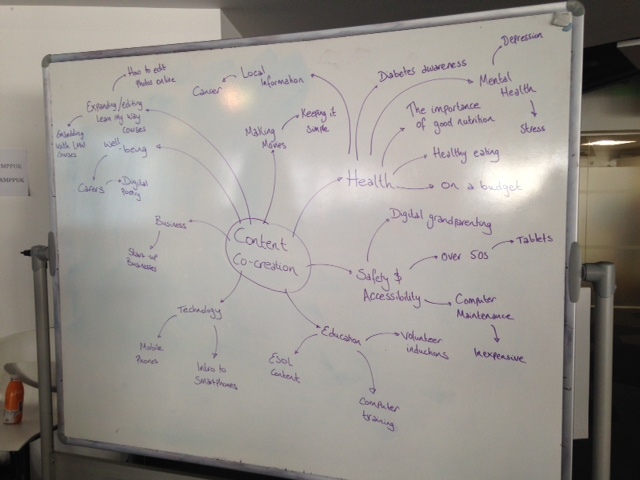 We’ve been piloting co-creation too, in the run up to launching the new tool, and one really interesting aspect is where local centres are involving their clients/users in the process of designing and creating an online course, and therefore making it perfect for the intended audience – learners just like them. We all know that showing others is a great way to learn yourself, and now we’re putting some relevant tools in the hands of people in local communities to make that happen. This could be very interesting as Course Creator rolls out further. And the courses weren’t the only things we left with from the workshop, after a hard day’s creating. I for one – and a lot of the other people I have spoken to since – left feeling really positive about the potential of the course creator, and the innovative, collaborative atmosphere of the day. Adult learning can tend to be quite a traditional sector, so being able to create online courses really quickly and easily, with the potential to share them so widely, really felt quite revolutionary. And of course it helped being somewhere like Mozilla where exciting technological developments happen all the time. I talk lots about the huge power technology can have to help people save money, connect with friends and family, find work, get healthier, et al. But it can also have huge possibilities for learning. Course Creator is in a closed Beta at the moment, and there are still a few Beta bugs to be ironed out, but I’m pretty sure it will have a big impact by giving organisations both the tools and the confidence to create their own online learning content that they can measure and share with thousands of others. I’m so excited about the potential of this development that I know I’ll be back blogging about it again in no time.